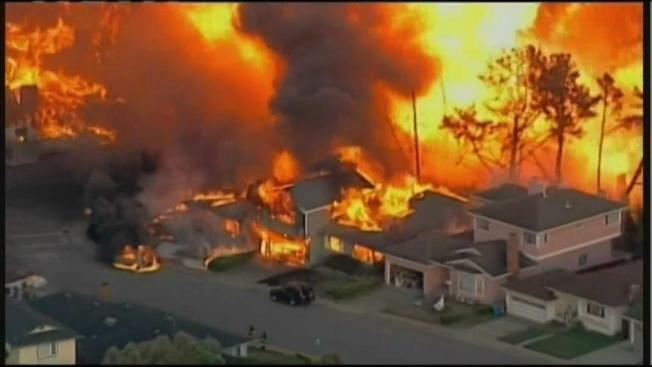 PG&E agreed Wednesday to pay shareholders $90 million to settle lawsuits that blamed the 2010 San Bruno pipeline disaster on corporate mismanagement. It marks the apparent end to seven years of legal battles over the explosion that killed eight people and destroyed 38 homes. Through it all, the company’s management was repeatedly accused of valuing profits over safety. In a statement, one of the attorneys suing the company’s management said the shareholder settlement resolves all claims against both current and former corporate officers "on favorable terms for PG&E and its shareholders." The suits – which started a month after the blast -- had been on hold pending the federal criminal trial in which the company was ultimately found guilty of pipeline safety violations and a lone count of obstructing the federal investigation of the disaster that left eight dead and destroyed the Crestmoor neighborhood. The company did not appeal the jury’s verdict and said the $3 million federal penalty. The judge ordered the company’s executives to perform community service, develop a mea culpa advertising campaign and submit to review by a federally appointed safety monitor for five years. The shareholder deal comes two years after state regulators imposed a record $1.6 billion regulatory penalty against the company for regulatory violations arising out of the San Bruno blast. That was on top of the $565 million the company paid to settle civil claims arising out of the explosion, bringing the total payout to more than $2.2 billion. In a statement issued late Wednesday, shareholder attorney Frank Pitre said the deal was preferable to waging a risky court fight over whether the corporate officers breached their duties to the company. PG&E touted the deal as a step forward to improving safety. “Just as our decision not to appeal the verdict in the criminal trial has allowed us to move forward, we believe settling this case is another step in the right direction,” the company said in a statement.